Samoa Football > News > Club Workshop > Club Strengthening Workshop a Success for Samoa Soccer Clubs. Club Strengthening Workshop a Success for Samoa Soccer Clubs. Representatives from the 12 FFS affiliated club members participated in the two-day workshop. This workshop is part of the ‘Win In Oceania’ program, which is funded by OFC and FIFA. 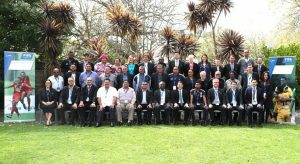 Assisting FFS with conducting the workshop were Vairani Davio, Win In Oceania Project Manager, Glenn Turner, FIFA Development Officer, and Greg Larsen, OFC Deputy General Secretary. The main aim of the workshop was for clubs to increase their understanding of what the roles and functions of a club is, to support clubs with becoming legal entities, to provide assistance in setting up by-laws, and also to help clubs in strengthening there internal structures. Workshop instructor Davio explained the significance of the workshop: “We are here to assist the clubs to become legal entities. We would like to see the clubs be structured and well managed according to good governance and in a transparent manner”. The clubs were also given the opportunity to hear from local club, Kiwi Soccer Club on how they structure and manage their club in Samoa. This included Kiwi’s vision, development programs, achievements, and financial management structures. Workshop participant and Central United Cub President, Andy Ripley was very pleased with the workshop and he added: “This workshop benefits our club to see the importance of having an organized structure and to become a legal entity. Right now clubs mainly focus on short- term planning, like from year to year. This workshop encourages us to look into the future and to plan over a longer period of time”. Next PostFather John bids Farewell to Samoa. Father John bids Farewell to Samoa.